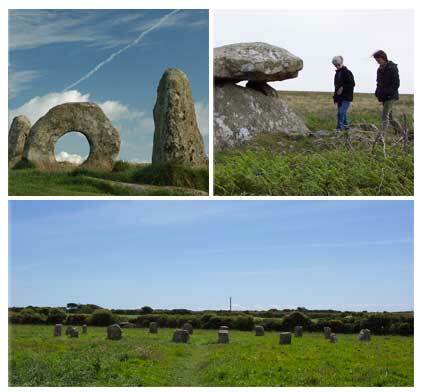 The Cornish Ancient Sites Protection Network (CASPN) is a Charitable Trust and a local partnership organisation that exists to protect and conserve the ancient sites and monuments of west Cornwall, so that people of all ages and abilities can enjoy and appreciate them forever. The Cornish Ancient Sites Protection Network (CASPN) was conceived in 1997, and established as a Charitable Trust in 2000. We came together as a group of representatives from a wide range of organisations, all of us concerned about protecting the ancient sites. In part these concerns were in response to disturbing incidents such as the attempted theft of one of the Merry Maiden stones, the arsonist attacks on the Mên-an-Tol and Lanyon Quoit, and fears over the numbers of visitors anticipated at the 1999 Solar Eclipse. But there were other ongoing concerns related to access, conservation and responsible site use. Initially our work focused on West Penwith, although our aim was to extend our reach throughout Cornwall, we now do this via partnership organisations. West Penwith is an area of Cornwall that has the highest concentration of ancient sites in Western Europe. Because of its natural beauty it is an attractive tourist destination, and over the years ancient sites have become ever more popular. Unfortunately this growing public interest has meant that the well known sites are frequently overused and misused. Other, less well known sites suffer from neglect. Ancient sites are in theory protected by law through the designation of Ancient Scheduled Monuments, but in reality this legislation does not afford adequate protection. The increasing pressure of people combined with environmental changes is a constant threat that is addressed by statutory bodies such as Historic England and the Cornwall Council’s Historic Environment Service (HES). These organisations are responsible for protecting the heritage landscape, but unfortunately their resources are severely limited. The National Trust does a good job of managing the sites that fall on their own land, but by far the majority of sites are privately owned, and these landowners do not always have the knowledge, time, financial means or resources to effectively care for sites on their land. CASPN was founded to address these issues, and for the first time brought together a seemingly disparate committee of representatives from both mainstream establishment organisations and alternative user groups. partnership with the wider community united by one vision: to safeguard our ancient heritage for the future. Historic England and Cornwall Council’s Historic Environment Service are the primary statutory bodies responsible for the heritage environment in Penwith, but because of financial constraints their role is restricted to that of monitoring and reacting to problems at specific monuments. Despite their best efforts and having to work with reduced resources, they are not able to provide enough of the proactive, strategic management that is required to safeguard this heritage asset. There are other organisations and community groups that have an interest in ancient sites, but historically there has been until recently a lack of co-operation and co-ordination in their protection and care. Now, through its close involvement with the Penwith Landscape Partnership, Cornwall Archaeology Society monument watch scheme and Cornwall Area of Outstanding Natural Beauty, a much more productive relationship exists. CASPN’s work was initially supported by the National Lottery’ Awards for All programme and the Penwith Community Development Trust. More recently the Area of Outstanding Natural Beauty Sustainable Development Fund gave a grant towards the support of our site clearance work and the design of our first website. These grants have been vital to our work, but it is the hard work and commitment of our volunteers that has sustained us. Our funding now comes from those who support us by paying our annual subscriptions. All committee members are unpaid volunteers and our expenditure comprises of tool replacement, insurance and other normal administrative costs. Found some damage at an ancient site in Penwith? Let us know!